Travel the scenic routes of the Pine Barrens and see what makes this area so very special, and understand why this environmentally-sensitive region should be preserved! Please feel free to print out the following tour itineraries for your personal use; however, reproduction of tour itineraries for use in other websites or for distribution is not permitted, as they are the sole property of PineyPower and not intended for commercial or mass use. Please phone (609-698-2501) PineyPower with any questions. If you stop into any of the locations listed in the self-guided Tours that we have prepared for you, please tell the business or facility owners/managers that you found them through PineyPower.com! If you're planning your first visit to the Pine Barrens, this route will pass cranberry and blueberry farms, and includes a visit to Historic Batsto Village. 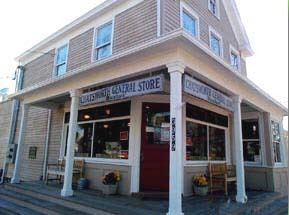 Start your day at the intersection of Route 563 and 532 in Chatsworth, the unofficial "capital of the Pine Barrens" and the location of the historic Buzby's Chatsworth General Store (10/2017 ed. note: the shop is currently closed, waiting for a new owner to continue the tradition.). 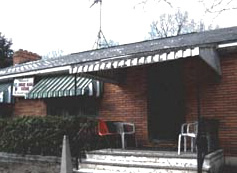 The popular Hot Diggity Dog, a very casual outdoor restaurant, is just across the street, so if you've a hankering for the best hot dog outside of Philly, stop and fill up there! If the Chatsworth United Methodist Church is open, think about a quick stop to see the beautiful stained-glass windows depicting nature in the Pines. The 10,243-acre Franklin Parker Preserve is located in Chatsworth. at 1450 Route 532. This former cranberry/blueberry farm is now protected by the NJ Conservation Foundation. It offers miles of trails through a variety of terrains, a haven for nature lovers. Parking is provided, but vehicles are not allowed inside the Preserve. Map. Head south on Route 563. After passing through town, and the Ocean Spray Cranberry Receiving Station on the west side of 563, you'll enter the village of Speedwell. (There is another entrance to Franklin Parker Preserve here.) 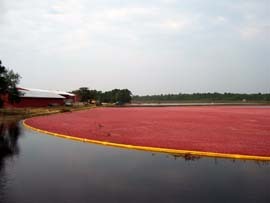 Continuing on, you will pass the two large cranberry farms, Lee Brothers, and the state's largest, Pine Island. While the actual harvest takes place in October, many days will find some activity going on. There are several great vistas as you drive down the road, but please keep in mind that these farms are on private property, and trespassing is illegal! Heading south about 4 iles, keep to the left at the 679 fork. Just after passing Harrisville Lake, about 1 1/2 on the left, pull into the dirt parking area on the right, and look for the ruins of the Harrisville Paper Mill. The ruins are surrounded by a 6' chain link fence to prevent vandalism, but a decent view can still be had. Harrisville has a colorful past - here's a short video. Stay on Route 679, turning right on Route 653/542 W. towards Leektown. You'll get a good view of Wetlands as you cross the bridge over the Wading River. When you're ready for lunch, look for The Lower Bank Tavern on the right for what's said to be the best burger around! You can also get a veggie burger, or grilled chicken breast sandwich, or fish & chips, a Grilled T-bone or maybe some hot wings - there's plenty to choose from. You don't need "fancy" for fantastic food! If you've got kids, there is a dining room separate from the bar area. Tell owner/chef Billy that PineyPower sent you. Continue on Route 542 for a scenic drive to Batsto Historic Village, with numerous panoramic views of the beautiful and very historic Mullica River on your left along the way. Batsto Village is located within the Wharton State Forest, and has great nature trails, including part of the 50-mile BATONA TRAIL, as well as the beautifully restored town. Stop in the Welcome Center - it contains a small museum, and a short movie that runs continuously. The gift shop also has a lot of interesting information about the fascinating history of the area. Take a self-guided tour of the village. (The beautiful mansion is very photogenic, but it's closed for renovations until further notice.) Don't miss another photo op at the lumber mill by the dam of the Batsto Lake. Beyond this are the workers' cottages and Nature Center. You can end your day now and head home, but why not make it a mini-vacation and stay at the Econo Lodge? (609-561-5700) Continue on Route 542 West, passing huge fields of blueberries! After all, Hammonton is the Blueberry Capital of the WORLD! At Route 30, continue west about a half-mile to the hotel. Check into your room, freshen up, then enjoy dinner at a local restaurant. For a special night out, I personally recommend Annata Wine Bar in downtown Hammonton. The food is excellent, and there is a huge offering of wines from around the world! For more casual, but equally delicious fare with an Italian flare, Rocco's Townhouse is perfect! Rocco's also has an extensive craft beer selection and a staff familiar with its offerings - what could be better? Day Two: After checking out of the Econo Lodge, take Route 30 East to Route 206 North. Continue north on Route 206. You'll pass Atsion Lake on the left. Immediately after, on the right, you'll see the Atsion Mansion, which has been restored by the State of NJ; tours of the mansion are available seasonally on weekends, but call ahead: (609) 268-0444. Atsion is also part of Wharton State Forest, and some ruins can still be seen here. ATSION MAP. 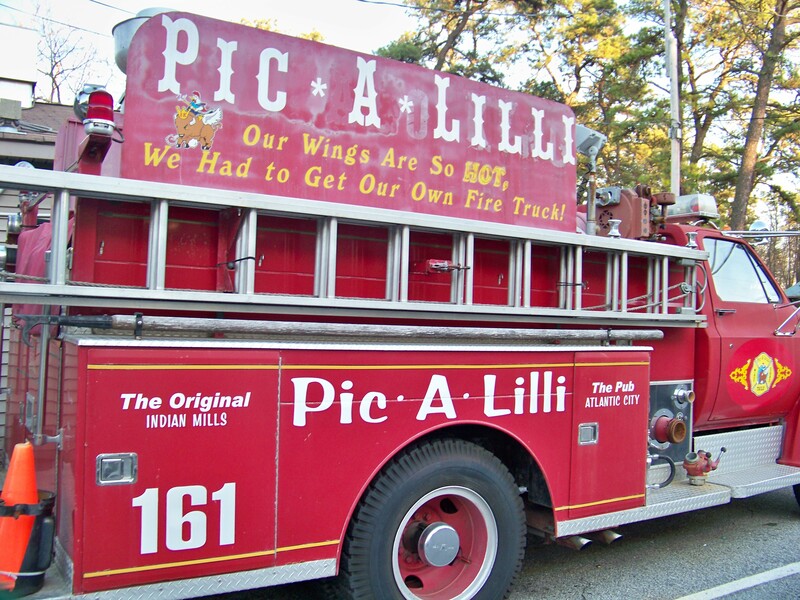 Just a short drive north of Atsion is a local favorite: Pic-A-Lilli Inn - you can't miss the red fire engine parked in front of the long, homey building. Inside, you'll be greeted by a long bar with sports games on (it's a GIANTS bar), but family dining is welcomed, with a glass fireplace going in cold weather! Pic's is known for their fantastic wings of all heat levels, but I also recommend the Loaded Baked Potato Soup! Staff here is friendly and makes you feel like an old friend. If you'd like to savor your visit to the Pine Barrens via a local wine, a stop at Valenzano Winery is a must! It's located a short drive north on Route 206, and offers tastings and tours. You can't miss it - the big, beautiful building on the east side of the road. From Valenzano, continue north on Route 206 and home, but if you're hungry again, stop at SHAMONG DINER- just a moment or two from Valenzano's on the west side of the road- owner Manny serves a huge variety of delicious foods, and has a nice Vegan selection! Here's the menu. Afterwards, stop at the Pine Barrens Store, right alongside the Diner, for almost anything you might need! 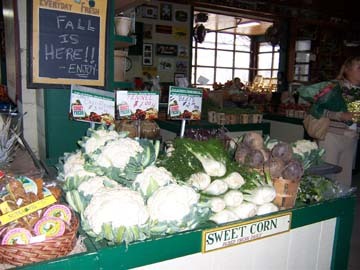 If you want some edible souviniers to take hom, head north to Route 532 and turn right, into the town of Tabernacle, where you'll find Russo's Farm Market, brimming with fresh local produce from Easter through Christmas - and be sure to try the apple cider donuts! Their produce prices are very reasonable. Whenever I visit, I'm amazed at how much I can get for so little! Depending on your home location, you can continue east back to Chatsworth and Ocean County, or take Route 206 north to return home. From Philadelphia Area: Route 70 East to Route 72 East. Look for Route 563 on the right; this will take you right into Chatsworth. From Trenton Area : Take Route 206 South to Route 70 east to Route 72 east. Look for Route 563 on the right; this will take you right into Chatsworth. From North Jersey: Take the Garden State Parkway south to Exit 69 (Waretown) and turn onto Route 532 WEST. Continue about 5 miles; turn RIGHT at Route 72. Continue on, passing the Pygmy Pine forest. Turn LEFT at Route 532 WEST/Chatsworth and continue about 4 miles. This will take you right to Buzby's Chatsworth General Store, located at the intersection of Routes 532 and 563. From South Jersey: Take the Garden State Parkway north to Exit 58; turn onto Route 539 NORTH. At Route 72 intersection, turn LEFT/West; Continue on, passing the Pygmy Pine forest; turn LEFT at Route 532 WEST/Chatsworth and continue about 4 miles. This will take you right to Buzby's Chatsworth General Store, located at the intersection of Routes 532 and 563. The Jersey shore is much more than ocean beaches and boardwalks. The bayshore between the barrier islands and the mainland is rich in ecology, history and legend! 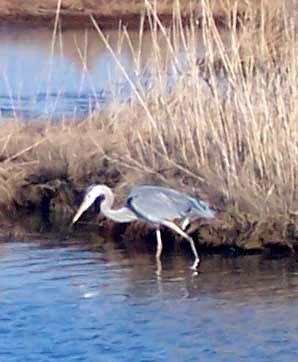 Most of the area north of Atlantic City is within the Pinelands National Reserve, so there are plenty of wildlife areas to explore by car, kayak or foot. There's something to do here year-round, so don't let the weather stop you from visiting! With historic Tuckerton NJ as your starting point, visit Tuckerton Seaport, located in the heart of town on Route 9. In season, have lunch at Skeeter's, or wait until you're headed south to the Forsythe Wildlife Refuge. When you get to New Gretna (Burlington County), turn onto Route 542 West (Batsto), drive about 5 miles to Lower Bank Tavern for a delicious, but reasonably-priced lunch. You'll see a wonderful example of freshwater wetlands as you cross the Wading River! After lunch, return to Route 9 and continue south. You will briefly be on the Garden State Parkway in order to cross the Mullica River. Pass Historic Smithville Village on your right, then look for turn left on E. Great Creek Road. Continue to the end, entering Forsythe Wildlife Refuge. There is an 8-mile loop road into the wetlands here at the Refuge that offers some wonderful birding opportunities from right inside your car! Afterwards, stop at Historic Smithville village for shopping and a snack. For a fantastic seafood dinner right on the Bay, be sure to include Oyster Creek Inn as one of your stops! This popular seafood restaurant has some of the most delicious offerings in the region! You can end your day now and head home, but why not make it a mini-vacation and stay at the beautiful J.D. Thompson Inn (609-294-1331) in Tuckerton. Go to your room for a hot shower, then enjoy a delicious dinner at one of several local restaurants. Innkeepers Catherine and Lorenzo Lauro will be happy to recommend one! Day Two: After a delicious breakfast at the Inn and depending on your homeward route, the following stops are suggested. Returning North - Garden State Parkway to Exit 69; take Rt. 532 west, look for signs to Wells Mills County Park, located on 1,800 acres in Waretown. Visit the Nature Center, and if weather permits, take a short hike on one of many trails. Returning South - Garden State Parkway to Exit 10B, to Route 657 East (Stone Harbor Blvd.) 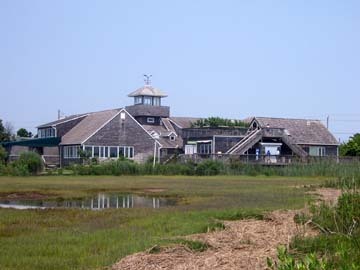 to Stone Harbor and The Wetlands Institute, where you'll learn all about coastal ecology. The book and gift shop here is fantastic! Returning West to Trenton area - From Route 72 West, take Route 532 about 4 miles west to Chatsworth, where you'll Buzby's Chatsworth General Store which is currenly for sale. This historic building in the "heart of the Pine Barrens"
Returning west to the Philly area - Take Route 9 south to Route 542 west; follow to Historic Batsto Village, where you can tour the village, or just visit the museum and gift shop and learn about the fascinating history of Iron in the Pines, the importance of the area during the Revolutionary War and more. From Philadelphia: Route 76/676 to Route 42/Atlantic City Expressway, then North on Garden State Parkway. Get off at Exit 50 to Route 9 North. Continue about 7 miles to Little Egg Harbor Township and Tuckerton. From Trenton: Take Route 206 to Route 70 east to Route 72 east. Look for traffic signal at Route 539; turn right. Follow Route 539 south (becomes Green Street) to Route 9 (Main Street) in Tuckerton. From North Jersey: Take the Garden State Parkway south to Exit 58 (Tuckerton/Little Egg Harbor). Make a left at end of ramp onto Rt. 539 South. Follow Route 539 to Route 9 in Tuckerton (Main Street). From South Jersey: Take the Garden State Parkway north to Exit 50 (New Gretna/Route 9 north). 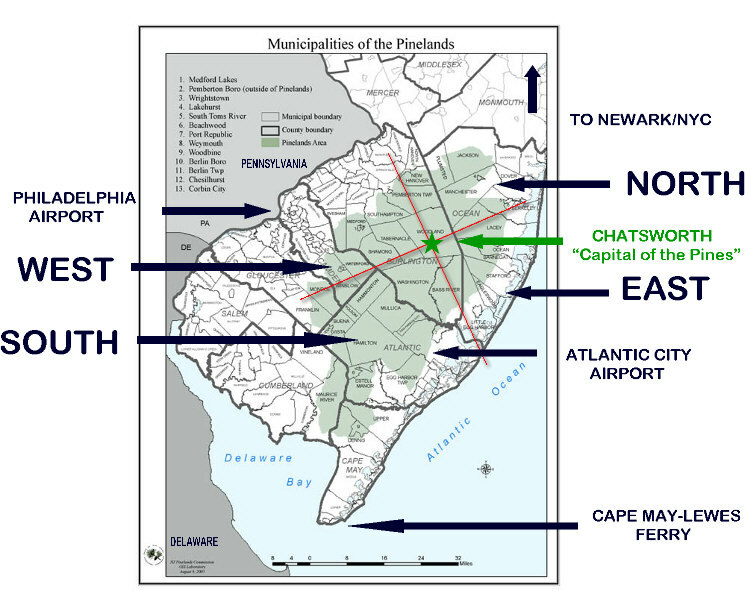 Follow Route 9 north for approximately 7 miles through New Gretna and into Little Egg Harbor Township and Tuckerton. The Pine Barrens is becoming a popular tourist destination. It offers history, nature, boating and fishing, swimming, camping, and most of all, peace and tranquility in our great outdoors. It's important to families who live here, whether for a few years or many generations, that our peace and tranquility be preserved. Thousand dollar suits aren't what impress people of the Pines - taking care of nature and fellow man is what matters. To that end, it is important for you to know that as a visitor to our precious Pine Barrens, you should show respect for the flora and fauna, for the historical buildings or their remains, and show respect for the "locals". Walk, talk and drive gently. DON'T LITTER. Respect the privacy of others. Treat our Pine Barrens as you would would want a visitor to treat your own home town. The people of the Pine Barrens are wonderful, caring people who want to protect the Pine Barrens; if you follow these simple guidelines, you too will be treated with respect and congeniality.